By far one of the worst parts of travel (aside from the potential costs) is the lengthy periods spent waiting in line at attractions. The more popular the attraction, the bigger the line up. And do you know what’s even worse – waiting in line with kids! Whether you are queuing to climb the Eiffel Tower or to ride the newest ride at Disneyland, kids waiting in line can be downright painful. They get bored in zero to 10 seconds. They get hungry. Their feet hurt. They get restless and misbehave. Or worst of all – they suddenly get that desperate need to pee. So keep the little members of your travel party happier with fun things to do while waiting in line. 1.12 What are your favourite things to do waiting in line with kids? You may be surprised just how many things you can do to keep children waiting in line occupied. And let’s face it, even us adults don’t mind the entertainment when standing still for a while. There is plenty you can do with no props at all, no matter where you are! And when you are travelling with kids, you want to be able to pull out a few of these on the spot tricks to get them through the boring bits! This classic game is popular for the simple fact that you don’t actually need any resources to play, so its one of the most perfect games to play while queuing or waiting around. This means you can play it anywhere, at anytime, with any number of people (within reason). Take in turns of spotting something in view, while everyone else tries to guess what your ‘thing’ is. “I spy with my little eye something beginning with…”. Come prepared for your destination if possible, or revert to the modern technology of a smartphone and share cool facts about your destination with the family. Sometimes you are lucky enough to pick up a brochure while you queue, or you may plan ahead with a guidebook or bookmarked website for this very purpose. Lonely Planet have a huge range of ebooks for reading on the go so you can download them to your phone before you travel for easy reference. You can also turn this into a game instead by having each member of the family share what you already know about the place you are about to see or the thing you are about to do. You may all be surprised how much you do know, and it makes a great educational exercise for your kids too. No matter the destination, one of the biggest saviours when travelling with kids is ensuring you are stocked up on snacks. Not only does food keep little stomachs happy, it also cures boredom for a few minutes at least. Most importantly, keeping the hunger at bay keeps the irritation levels down while you wait in line. Hungry bored children are the worst kind of travellers! Healthy snacks you can pack in your bag that won’t get crushed or make a mess are ideal, but the occasional treat is okay too. Make sure you have a bottle of water wherever you go as well. Another great option for things to do while waiting in line with kids is play the alphabet game. Pick a topic such as superheros, actors, fruits or animals and take in turns coming up with an answer for each letter of the alphabet. If you get stuck, the next person can jump in. For example: Fruit A – Apple, B – Banana, C – Cherry etc. You can just go round your group taking in turns, or if you have older kids who like a bit of competition, you can keep track of how many answers each person gets and declare a winner at the end of each round. Make the waiting in line fun by coming up with a plan for where you will go and what you will do next. This not only builds excitement for your next activity, but also helps the time pass quicker. Especially when you give the kids a little bit of the decision making power. When coming up with things to do while waiting in line, you are surrounded by other people doing exactly the same thing, so why not strike up a conversation with the strangers beside you. Perfect if you speak the same language, although a bit challenging if not. New people can be an interesting way to pass time. Kids are often brilliant at this. So often our kids make new friends when we are travelling, finding another child around their age to play with for 10 minutes as we wait in line or spend some time at the park. This is such a wonderful trait children have and one us adults can learn from. It does get harder to make friends as we grow up, but it shouldn’t. Everyone has a unique and interesting story to tell so start opening up the conversation if those around you appear open to a chat. Yet another way to make use of the crowds around you is to create a story about some of the people in waiting nearby (although maybe not in earshot). Perhaps the lady in the red jacket is a French spy, or the man in the loafers could be a member of the royal family from a country far away. Kids have great imaginations and will have a blast coming up with the most creative story. There are sure to be a few laughs along the way. You might want to make sure your kids are skilled in using their quiet voices first though because otherwise it could get a little embarrassing! Not the most exciting game in the world, but it will give a few minutes of entertainment. As will other similar games requiring no props or space to play. 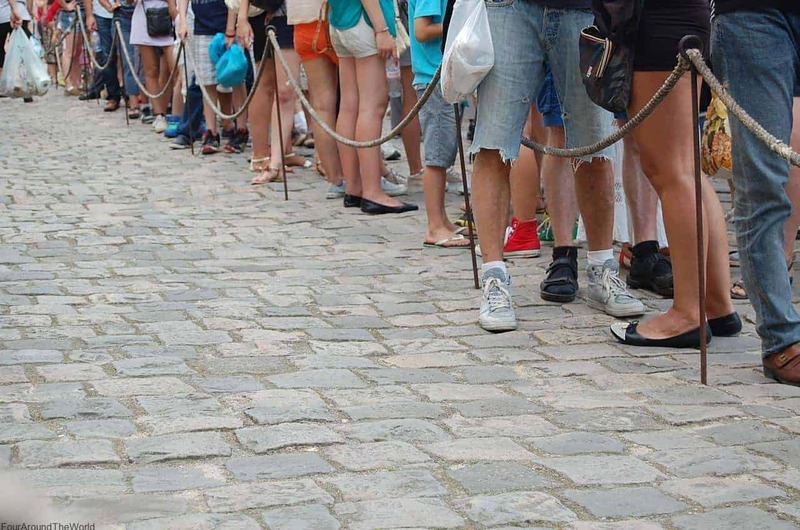 Knowing how to make waiting in line fun is a good skill to have and kids in line can easily play a few rounds of scissors, paper, rock. It can also be a fun way to decide who picks what you get to have for lunch or what the next attraction you visit is. If you are waiting for transport or not necessarily in a large group of people, some other no prop games include charades, Simon Says etc. You might get a few strange looks if there’s others waiting with you though. If the queue is moving very slowly, or not at all for a while, one of the things to do while waiting in line is to catch up on travel journal entries. Whether you kids have a journal with them in their day bag, or you can pull out some loose note paper for them to write on and stick in later, this can be a great way to fill a big wait, while also documenting their important travel memories. It is pretty special to look back at past travel diaries and see what you have written and a fun way for kids to remember their favourite experiences when they go back to school and tell their friends too. One of the benefits of living in the digital age is the access we have to electronic gadgets that provide us entertainment. Not a great option when you are encouraging your kids to get out there and see the world but when waiting in queue, it can sometimes be a case of desperate measures for all of you. Consider downloading a couple of fun family friendly games onto your phone that you can play together, such as a logo guessing game or trivia so you can all join in coming up with the answers. Just make sure you don’t drain your phone battery. Never a good option when travelling unfamiliar places! We always keep a portable charger in our day bag just in case. Some other great tips to help make your waiting time easier is to ensure your kids are comfortable and have somewhere they can sit down. This may mean letting them sit on the ground nearby, just to give their legs a rest. Make sure they are in your line of sight at all nights though. We took a travel stroller with us for our kids up until they were around 2 or 3. While we may not need it back home, when travelling we tend to do longer days so knowing they could rest their legs and not need to be carried was much easier for all of us. Don’t cram too much into your days. Sometimes you need to just head back to your hotel and chill out for an hour to avoid over stimulated, grumpy kids. Or maybe it means missing something you hoped to see. It happens. And it’s not the end of the world! Planning for a road trip soon? Check out our top tips for surviving road trips with kids! We even have a road trip activity bundle in our store! What are your favourite things to do waiting in line with kids? Yes this is one of my least favourite things about travelling with kids, especially queuing at the airport. We spent about 90mins lining up at London Stansted airport after getting off a flight- passport control was being extra careful as this was the day after the incident in Tunisia. The kids misbehaved the entire time we were waiting, and being at the airport there wasn’t much we could do. In hindsight, I should have been more prepared! Thanks for your tips! We all have those moments. Our worst was a very bored & grumpy toddler lined up at an airport in Vietnam. I can’t even remember which but it was painful & people kept trying to push in. Lining up is the worst! Eye spy is becoming a fave of ours in traffic lately! These are all great tips. I like to give my kids a task so they feel responsible for something. And food, always food! I love that idea Malinda. Make them feel important. Great tip. I remember playing Atlas with my dad everytime we would be traveling somewhere alone. Each play will have to name a country or a city, and the 2nd player would have to come up with city name which starts with the letter that was the end letter of the 1st player’s city name. Due to this, I became very good at Geography. That’s awesome! Games that help with learning are a great bonus!! !